OXFORD, Miss. 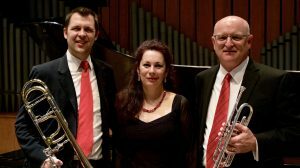 – Brass and ivory converge to create a fascinating musical treat for Valentine’s Day at the University of Mississippi. The Brass and Ivory Trio will perform at 7:30 p.m. Thursday (Feb. 14) in Nutt Auditorium, offering an inventive program and rich, beautiful music to those celebrating – or even avoiding – Valentine’s Day this year. Although brass soloists are common, the trio features both a trumpet and a trombone playing with piano, which is a far less traditional scenario. It may be more unusual, “but it works,” said Micah Everett, UM associate professor of music. The program features the music of Leonard Bernstein, Jean-Michel Damase, Joseph Turrin and Jan Koetsier. The Brass and Ivory Trio is Richard Rulli on trumpet, Cory Mixdorf on trombone and Miroslava Panayotova on piano. All three musicians are on the music faculty of the University of Arkansas. Tickets are $10 for adults, $5 for children or anyone with an Ole Miss ID, and are available from the UM Box Office or at the door.